Socialized Health Care | Kingwood TEA Party, Inc.
Obama administration diverts $500M to IRS to implement healthcare reform law – The Hill’s Healthwatch. That’s a Kingwood TEA Party button next to the American and Gadsden flags. 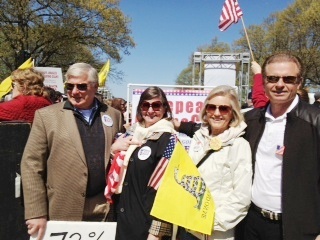 Thank you, Jeremy and Mary Carol for representing us in front of the Supreme Court! Obamacare is unconstitutional and must be repealed in its entirety. That is why I voted for the full repeal of the President’s nationalized healthcare bill, including the Independent Payment Advisory Board (IPAB). I have also introduced legislation to defund the individual mandate provision of Obamacare. Although I fully support the repeal of IPAB and have cosponsored legislation to repeal it (H.R. 452), I cannot support final passage of H.R. 5 because the bill includes provisions that I believe violate states’ rights and the 10th Amendment. As a strict constitutionalist and a fierce defender of states’ rights, I cannot accept replacing one unconstitutional law with another. Read Rep. Poe’s entire statement here. He wasn’t against repealing IPAB, of course–he’s already voted to rescind ObamaCare in its entirety. With KWTP’s encouragement (click on “more” below to see our email to him), Rep. Poe voted against the amendment our RINO Republican Leadership added to address Tort Reform. This legislation, though it sounds good is a gross encroachment on the constitutional powers that rightfully belong to the States. A very good review of the Cain-Gingrich debate put on by our friends at Texas Tea Party Patriots PAC. This is not just coming–it is here. I already experienced it when my generic blood pressure medicine was suddenly not available anywhere for months. Looked into it and discovered that Americans are in danger of death, if not already dead, as hospitals run out of the needed cancer drugs in the middle of the treatment. Between the AstroTurf riots and drug shortages occurring now, before ObamaCare is fully implemented, I am very concerned. Will we survive as a free nation until the elections of 2012? Excerpt: “If you look closely, the reason is easy to see: The health care sector lacks most of the basic building blocks of a functioning market. For one thing, markets require transparent prices, so that consumers can discover value. But in health care, the “consumer” is usually either a big insurance company, or the government. Health care providers have no incentive to provide transparent prices to their patients, because their patients don’t pay directly – it’s the government bureaucrat or the insurance company bureaucrat who pays the bills. Second, markets do not function well when consumers are insulated from marginal costs. We’re all paying more for health care, through much higher premiums and taxes. But the share we pay at the doctor’s office has plunged. The system that shields us from the cost of services, has actually left us paying much more. Rather than tackle these root drivers of the problem, the President’s law goes in the other direction. It expands broken government programs, enhances bureaucratic control, and imposes flawed mandates that will continue to drive up the cost of health care.